Five Sisters (working title) is an hour-long documentary produced by Good Hard Working People, LLC. 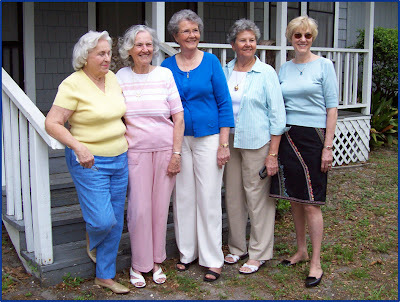 The film paints a portrait of five sisters, ranging in age from their late 60s to mid 80s, during the aftermath of the first of the sisters’ husbands having passed away. It is a film about the “greatest generation”, about sisterhood, about aging, and about family values. The central character is Beth, at 68 the youngest, who is on a quest to learn from her older sisters how to deal with issues of transition and aging. We attend their annual get-together with this year’s theme of “facing old age”, tag along on a tour of their childhood hometown, visit their current living situations and witness their lively interactions among each other and with other family members. Moving and enlightening, Five Sisters is full of joy and grief and tackles a subject that is essential to all of us – how to live fully and gracefully and yet be realistic about getting older and eventually dying. The subject of old age and death are universal – yet we do not speak of them often. Five Sisters will encourage the discussion of how to live and age well and thus bring comfort and inspiration not only to the elderly but also to the successive generations. The documentary is being shot on 24p Mini DV and will be mastered to Digi Beta for broadcast. Five Sisters will include interviews with the sisters and their husbands and children, vérité footage of their time together, archival film and photographs.